Mega Sale! Free Shipping Included! Save 27% on the Bayou Classic 4225 42 Quart Grand Gobbler Turkey Fryer by Bayou Classic at Grow Website. MPN: 4225. Hurry! Limited time offer. Offer valid only while supplies last. For 30 years Bayou Classic has been an industry innovator providing outdoor cooking equipment catering to events in every region & every season. For 30 years Bayou Classic has been an industry innovator providing outdoor cooking equipment catering to events in every region & every season. Turkey frying season is approaching & Bayou Classic introduces the grand gobbler for frying large turkeys. 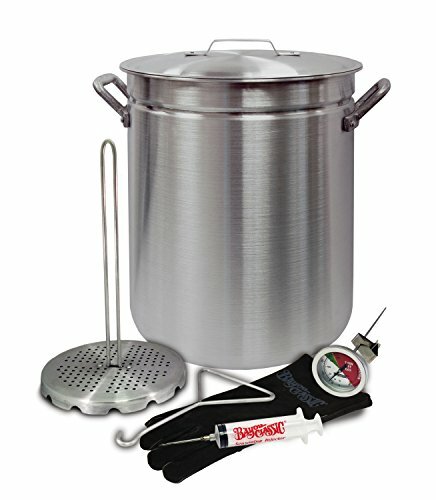 The new Bayou Classic 42-qt grand gobbler is specifically designed to fry your larger Thanksgiving Turkey to 25 lb & features: 42-qt aluminum stockpot with lid & riveted handles; patented poultry rack & lift hook; stainless 12" fry thermometer; 2-oz. Seasoning Injector; protective leather glove. Made of 99% pure aluminum, this 42-qt Turkey fryer features heavy duty riveted handles & a vented lid. Inside the pot is a patented poultry rack & lift hook designed to create a circular flow of oil up through & around the cavity during the frying process. The final result is cooking your Thanksgiving Turkey golden brown. The select-grain leather glove (right hand only) protects from hot oil as you lift the Turkey, to slowly insert & later remove, from the pot. The stainless 12-in. Fry thermometer enables you to Monitor & maintain optimal frying temperature. The 2 oz. Seasoning Injector with stainless needle is ideal for infusing your favorite seasonings into the Turkey prior to cooking. Use outdoors only with your favorite Bayou Classic high pressure cooker. Yes, even larger size turkeysup to 35-lb can be fried in the grand gobbler, but legs & wings must first be removed & fried separately; otherwise, they will overcook. When doing this, fry the Turkey body following the standard instructions for whole turkeys. Typically, legs & wings require 18 Min to cook separately. Remove the rack & hook to use this versatile stockpot year round for cooking soup, Shrimp, Crabs, corn, peanuts, jambalaya, low country boil or gumbo. The Bayou Classic grand gobbler is your next must-have outdoor cooking equipment.